It is difficult to characterize Michigan's massive second-half flop last night as anything other than an epic failure in coaching. For much of this season, the oft-named "best coach in college basketball", John Beilein, has looked absent, unable to maintain the success of last year and stop the bleeding in 2010. Beilein isn't missing three pointers. He isn't being out-rebounded by nearly every team Michigan's played. He does, however, seem completely lost when it comes to fixing the team's myriad issues, attacking opposing defenses, fixing his own, or manufacturing wins in the way he had become famous for during his successful and over-achieving NCAA Tournament career. I am not encouraged by his recent contract extension. On offense, Michigan turned the ball over 17 times, most of them coming in the second half when Northwestern tweaked their 1-3-1 and began trapping Michigan's inexperienced guards high and early. How does Michigan and Beilein not have an answer for this? Isn't this the base defense in Beilein's system? The fact that Michigan kept doing the same thing over and over and over again speaks to the stagnancy of the offense and Beilein's inability to twist and rework it--not that he should, as some suggest, move away from the three pointer or overhaul his system, but in-game adjustments would be nice. Turnovers aside, the team still can't shoot three pointers at a high clip (bucketing just over 30% of their shots from the outside against Northwestern) and generally had trouble creating anything other than giving Sims the ball on the block. This was so clearly the focus of the game--Beilein obviously practiced getting Sims the ball at all times--that the team passed up open looks or better passes to try and thread the needle to Sims, often resulting in a turnover. Worse, though, was Michigan on the defensive side of the ball. In the first 15 minutes of the first half, man-to-man coverage was working well. But then Drew Crawford took over and started to light the team up from outside. Then the second half started and Michigan continued to play man-to-man. And continued. And continued. And Northwestern finally established a large enough lead that they never surrendered. By my count, Michigan played the 1-3-1 zone on exactly one possession. It resulted in a turnover and a Manny Harris runout. I've been documenting Beilein's resistence to the 1-3-1 this season, and this game goes down with the Indiana flop as the two most egregious examples of Beilein failing to change his defensive schemes. 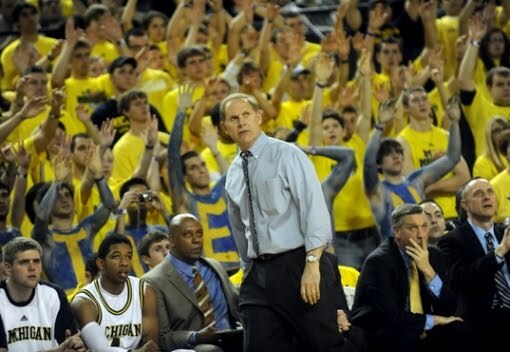 The shine of Beilein 2009 is fading. He's going to need to do something soon to inspire any kind of confidence with this team going forward. Because when your players are underachieving (or just bad) and your coach seems completely lost on the sideline. Well, you're 13-18 Tommy Amaker.